Issue #4 includes double spreads of 15 artists from St. Petersburg, FL to Morgantown, WV and all points in between. Five essays including our feature "Smelling Like Outside" by Dr. Regina Bradley from Kennesaw State University. 52 pages, perfect bound, full color. Cover, as always, by Artemis Antippas. Southern Glossary's first solo artist book in collaboration with photographer Kevin O'Mara. A self-taught photographer living in New Orleans, Louisiana with roots in middle Tennessee, Kevin O'Mara keeps an eye out for evocative night skies and vibrant decay. He collects books, bones, icons, skulls, and tokens. When not out with his camera he's usually busy making papier-mache masks in preparation for parading the streets of New Orleans during carnival season. Southern Glossary #3 features the work of 22 artists from Nashville to Birmingham and Atlanta to Baton Rouge. Includes essays by Brad Rhines and Lana Pugh and a cover by Artemis Antippas. Full size, perfect bound, 54 pages. 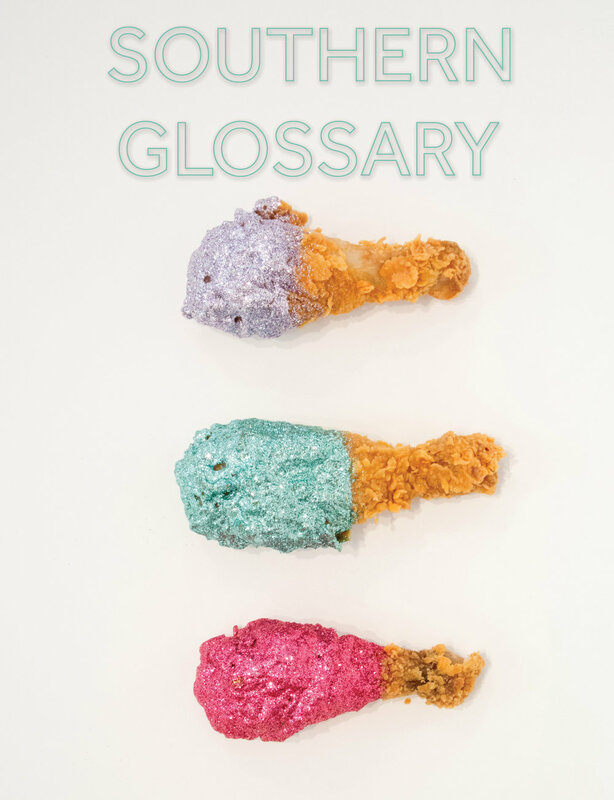 Southern Glossary #2 is in a full-size magazine format and features the work of 20 artists from Nashville to Tallahassee and Atlanta to Lafayette. Includes two essays by Ryan Sparks and Brit Hessler and a cover by Artemis Antippas. Full color, perfect bound, 48 pages. Southern Glossary's very first print edition! This 58 page magazine compiles work from over thirty artists who contributed to our rotating curator Instagram account during its first year. There are two essays from the co-founders of Southern Glossary, Ryan Sparks and Brad Rhines, as well as thoughts from several of the artists on their relationship to their surroundings, history, and the South's unique place within American art. Cover art by Artemis Antippas. All Southern Glossary products are sold at Defend New Orleans shops.